General Nathan Bedford Forrest, as portrayed by Ron Johnson. Wayne County is fortunate to have General Nathan Bedford Forrest come to visit on Tuesday, May 22, at 6:30 p.m. at the Wayne County Public Library. This is sure to be a quality program, commemorating the 150th anniversary of the Civil War. 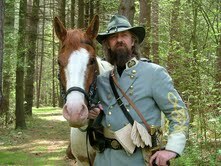 General Forrest, as portrayed by Ron Johnson of Boardman, Ohio, will speak in character and in costume. The general will be telling some of his life story and his involvement in the War Between the States for the South. He was a brilliant cavalry leader who rose from a private to a general during the war. When asked the secret of his success, he replied, “To get thar fustest with the mostus men!” and to “keep the skeer on.” It is said there were two geniuses that came out of that war — one being Abraham Lincoln and the other being Nathan Bedford Forrest. This program is presented by Wayne County Civil War Roundtable, in collaboration with Wayne County Public Library and Wayne County Historical Society. The program will be held in the Liberty Street Library Conference Room, and is open to the public. There is no charge. For more information, contact Jerry Payn at 330-345-5547. What a great picture of Mr. Johnson portraying General Forrest. My compliments to you ……….